Spring joy | Me fail? I fly! It’s about two and a half years since we moved home. 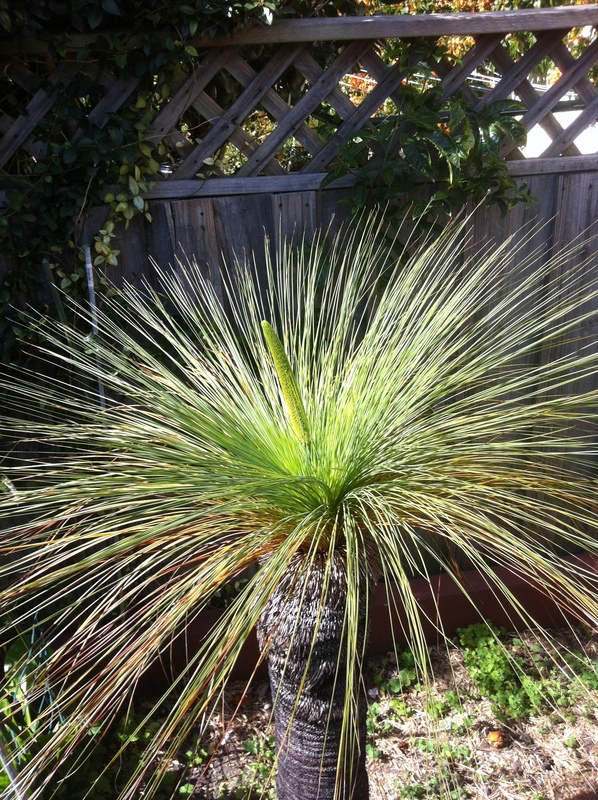 About a year ago, the grass tree (Xanthorrhoea) that had stood outside our kitchen window in the old house was ailing in its new location – most of its fronds were brown or browning. I took a photo of it to our local nursery and the man there said the plant was almost certainly dying: they don’t take to transplanting, and it will sometimes take as long as 2 years for them to die, and ours was well on the way. We could trim off all the dead and dying fronds, even sit a cardboard box on top of the plant and burn it, so that all the green growth was burnt back, but it was a slim chance, and the burning was the product of wishful thinking rather than a proven remedy. I didn’t do the burning, but I took to the leaves with a pair of secateurs and for months our once thriving grass tree was like a dead lump with a few green sprouts sticking out of its top. We made sure it wasn’t over-watered, and gradually it came back to good health. And on the weekend, we noticed it had produced a spike. In no time at all, as measured by grass trees, that spike will be more than a metre high and produce seeds and, if we harvest the seeds and plant them properly, in 20 years time we may even have a new generation of grass trees. They are a fascinating species – well done on your perserverence. I’m told never to cut the spike but to let it naturally fall. Thanks, Agnes, though I think all credit really goes to the rain gods and the force that through the green fuse drives the flower. I can’t imagine we would be tempted to cut the spike, Jen. I’m all impatient to see it grow tall and black. Thanks, greenspace – now of course I wish we had done the fire thing. It would make such a better story.